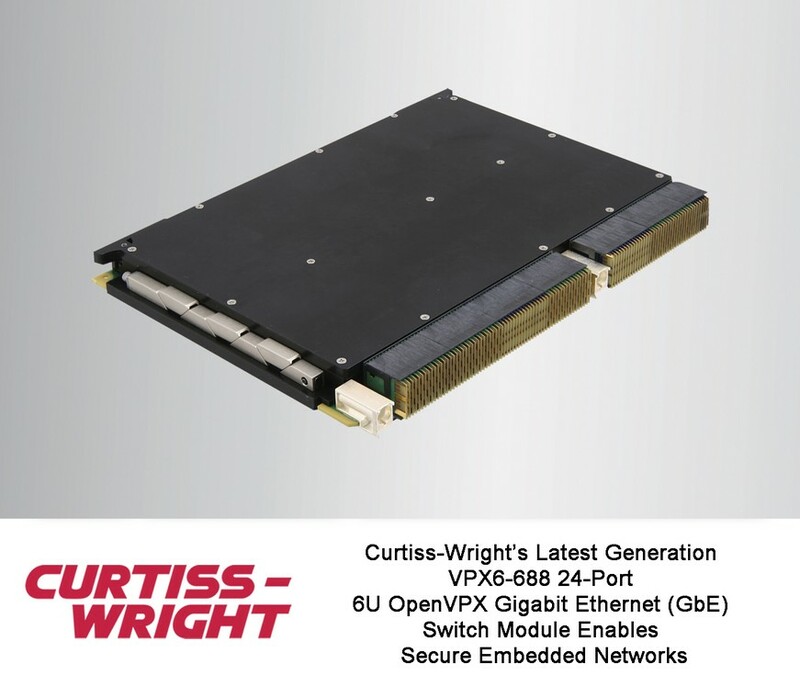 ASHBURN, Va. – July 10, 2018 – Curtiss-Wright’s Defense Solutions division has introduced the VPX6-688 24-Port 6U OpenVPX Gigabit Ethernet (GbE) Switch module. In addition to providing system integrators with a fully-featured GbE switch solution that simplifies the integration of a complete networking solution into open architecture VPX systems, this new, highly integrated, enterprise-class switch enables embedded systems to safely share data on intra-platform and wide-area networks. The rugged module addresses emerging requirements for network security by allowing non-essential services to be disabled. It also provides secured management interfaces for administration. 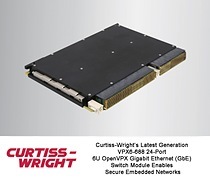 To protect against emerging cybersecurity threats, Curtiss-Wright provides regular network software updates, ensuring that the VPX6-688’s network security posture is kept up to date. If the application requires secure WAN connections, Curtiss-Wright offers an optional services mezzanine module that provides a fully-featured Cisco IOS™ router. Designed for use in demanding C4ISR applications, the VPX6-688 supports the high-precision IEEE 1588 Precision Time Protocol (PTP) synchronization required by real-time and signal processing applications. The rugged module provides 24 ports of IEEE 802.3 compliant 1000BASE-T Gigabit Ethernet to the backplane. Four optional 1000BASE-SX Gigabit links are available to support high-speed optical interfaces. The VPX6-688 delivers full performance in harsh environments, with line-rate switching on all ports across all packet sizes. Suitable for use with a wide range of embedded computing and vehicle network applications, the VPX6-688 provides standards-based network connectivity to VPX embedded computing systems. It’s ideal for integrating robust and secure Ethernet for airborne, naval and ground mobile networks, as well as fixed installations. • Pin-compatible replacement for the earlier VPX6-684 switch products to eases lifecycle extensions and upgrades. Embedded systems engineers must ensure that mission-critical data is given priority as platform networks become more congested. The VPX6-688 is designed with the latest networking features to manage quality of service, ensure efficient multicast stream distribution, and enforce policies for filtering and limiting data rates. It incorporates robust multi-layer switching services based on proven enterprise-class networking software. As embedded computers transition from stand-alone appliances to connected systems, the importance of network security continues to grow. The VPX6-688, designed from the start with cybersecurity in mind, offers secure management interfaces for configuring and monitoring the network. Hardware write-protection features can be used to prevent unauthorized or unintentional modification of the switch configuration. Regular updates to the VPX6-688’s software mitigates the risk of system compromise resulting from vulnerabilities in older operating system or networking services. Sales inquiries: Please forward all Sales and reader service inquiries to defensesales@curtisswright.com.